Receive automatic coverage, at no additional cost, when you pay your monthly cell phone bill with your business credit card. Rebates will be automatically credited to your monthly statement when you make purchases with your business credit card. Easy-to-read, monthly management reports. Doubles your original manufacturers' written U.S. warranty - up to one full year on items you purchase with your business credit card. Automatic protection against theft, accidental damage and fire for the first 90 days after your purchase. Including Lost Luggage Insurance, Travel Accident Insurance, and MasterRental Insurance Coverage. 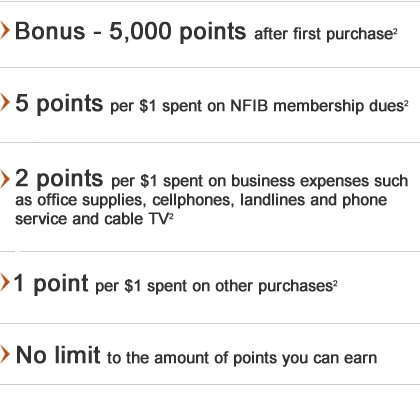 NFIB has selected First Bankcard® to present this exclusive offer to NFIB members. 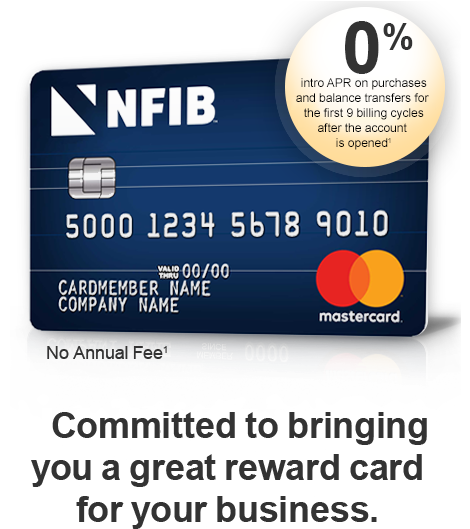 First Bankcard is a division of First National Bank of Omaha, a sixth generation family-owned business that is part of the largest privately-owned banking company in the nation. Please see the Summary of Credit Terms for important information on rates, fees, costs, conditions and limitations. An introductory balance transfer fee¹ of 4% applies to each balance transfer you make within the first 9 billing cycles (minimum $10). After that, a balance transfer fee of 5% applies to each balance transfer that you make (minimum $10). 4 Complete details including restrictions, limitations, and exclusions will be available when you become a cardmember.